While in Zanzibar, I've been tasting a whole feast of delicious dishes, many of which have one ingredient in common: coconut milk! I love cooking with coconut milk, but it sometimes seems like our only option is to use a tin. This isn't ideal, as tinned foods are quite Tamasic and can leave us feeling sluggish, not to mention all the chemicals contained in the tin itself. 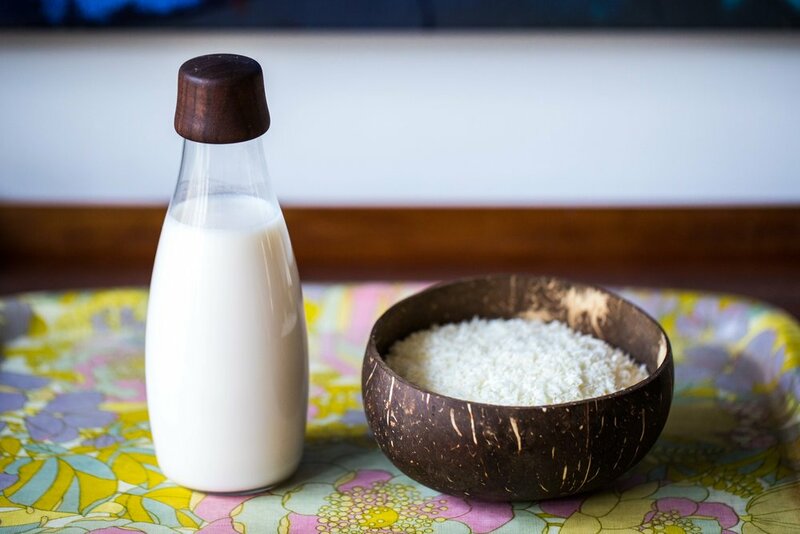 So if you've ever wondered how to make your own coconut milk, you absolutely can AND it's easy as 1, 2, 3! There are several methods, but here I'm sharing one that uses desiccated coconut in order to make the thick coconut milk we use in cooking. Place your coconut in a blender. Pour the boiling water over the coconut and blend until as smooth as you can get it. Strain the milk to get rid of the bits. Use immediately or keep in the fridge and consume within 1-2 days. East by West tip: To make a thinner drinking coconut milk, try my recipe in East by West page 257.